This second installment of Really Useful Guitar Stuff is all about chords. Having covered chord construction in Practical Music Theory it is now time to put all that knowledge to use and learn how to create chords all over the fingerboard. Starting with basic chord shapes and adapting them to many others is the perfect method of learning chords. It will help you remember all the different grips (shapes) because the relationships between chords is easy to learn and the practical application becomes obvious when you understand what chord tones you are playing in each shape. You will learn all the chords covered in the CAGED system (five positions of each chord) and remember that each chord can be placed on any root note - this gives you a great chord vocabulary of over 650 chords!! Chords covered are Major, Minor, Maj7, Dom7, Min7, Min7b5, Dim7, Maj6, Min6, Sus2 and Sus4. Chord extensions and alterations will be covered in a later volume. If you struggled with remembering chord shapes or always thought that it was a weak point in your playing, this pack is sure to help you out! THE EBOOK HAS EVOLVED! Please read below! As you might know I have been working on a revamped version of the website which will officially launch on June 4 - but it's live now for newsletter subscribers... and you :) The Practical Music Theory ebook and Chord Construction Guide have been absorbed, transformed and expanded into a paid section of the new site! The new Practical Music Theory is divided into grades and has over 100 lessons (and growing fast), many pdf download worksheets, tests and much more - it will be the best music theory resource for guitar players available and I will be working on it for many years to come! The new site is a subscription (which I need to do to be able to continue working on it) and the price is $9.99 for 6 months access and includes BOTH Practical Music Theory & Chord Construction Guide which you can download right away and obviously keep forever! Click here to see and access the new Practical Music Theory area! 27. Major and mini minor? 32. Outro… where to go from here? This pack is designed for people who have completed Practical Music Theory and wish to explore chord construction at a deeper level. It's divided into 3 parts, the first covers the E and A Shapes and is the most important information that should be mastered before moving onto Part 2 which covers the less common grips that use the C, D and G Shapes. Part 3 is just a reference guide to check your chord grips quickly and easily if you need to. Some knowledge of the CAGED Major scale positions will be very useful, but you can learn them as you go if you don't know them already (my DVD - Master The Major Scale will be a big help!). Those that have not completed Practical Music Theory should have a basic understanding of scales and chord construction. This book shows you 5 positions of every chord mentioned above (triad and quadad forms) but does not cover extended chords (9, 11 and 13ths) or alterations. These will come later once you have the basic chord grips down. You should be learning songs that use these chords and put them into practice as soon as possible but because of the techniques used in constructing the chords you should find that you can figure out most shapes even if you don't initially remember them! It will require you to work yourself, it's not a spoon feeding chord book! Not just a load of shapes to learn, but a guide to how chords are formed all over the neck and with a little work from yourself you will have a very solid understanding of chords and should be able to play most songs including most jazz standards with the chord grips you will learn in this pack. You will probably want to print out some of the blank chord box paper from the Resources section of the site to make the most of the practical examples - the more you do yourself the better you will learn it! 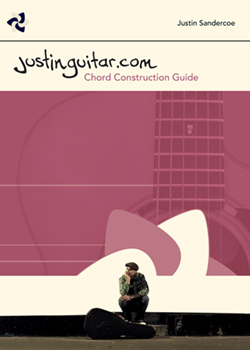 I strongly advise you start your own chord book if you haven't already! 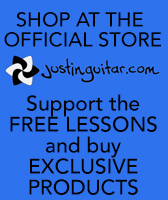 "Justin is always clear, concise and is a great communicator, which is why this is a fantastic book for guitar players wanting to get their theory onto the instrument and demystify topics that too many other tutors make unnecessarily complex!". Read reviews from people just like you on the forum... good and bad allowed... HERE. Written by Justin Sandercoe. All rights reserved ©2007-2009.